These links provide background information and tools for the amateur hunter of these elusive objects. Page on asteroids from SEDS. You will find here background data and a number of useful links. Linked pages on Asteroids (and Comets and other things) from Solarviews. A set of servers and databases providing information on small bodies in the planetary system. This is a joint venture between NASA and a small group of educational institutions. European Space Agency's website for mission and science information on a variety of probes, including Rosetta, Europe's comet chaser and lander. 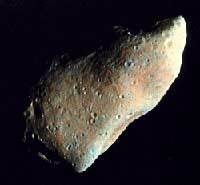 Near Earth Asteroid Rendezvous - NASA's mission to land a spacecraft on the asteroid 433 Eros (1898 DQ). The spacecraft landed on Eros on February 12, 2001. Excellent exposition of orbital mechanics. NASA's mission to Comet Borelly. Launched October 24, 1998; retired December 18, 2001. NASA's own verdict: "Highly successful".